The 20 drivers were Jérôme D’Ambrosio, Adrian Sutil, Paul di Resta, Sébastien Loeb, Sébastien Ogier, Jules Bianchi, Jean Eric Vergne, Robert Wickens, Franck Montagny, Filipe Albuquerque, Gary Paffett, Romain Grosjean, Romain Dumas, Julien Jousse, Olivier Lombard, Karun Chandhok, Sébastien Bourdais, Tristan Vautier, Stéphane Sarrazin and Nicolas Hamilton. 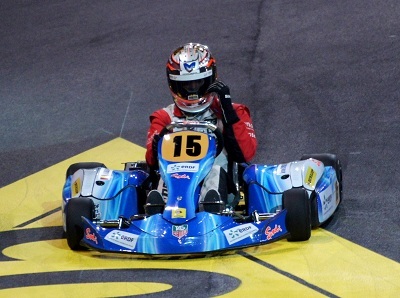 The drivers had two laps to do their best and during a long moment Jérôme was the leader with a brilliant lap! But then he was passed by 6 drivers. He’s 7th, which is not so bad :) And we’re proud of him!! The poleman is Olivier Lombard, followed by Romain Grosjean, Jean Eric Vergne, Sébastien Loeb, Filipe Albuquerque, Jérôme D’Ambrosio, Stéphane Sarrazin, Gary Paffett, Romain Dumas, Robert Wickens, Karun Chandhok, Sébastien Bourdais, Paul Di Resta, Jules Bianchi, Adrian Sutil, Franck Montagny, Nicolas Hamilton, Julien Jousse and Tristan Vautier. Jérôme took part of it as it was for the drivers who ended qualifications with an odd number. The winner was Ogier, followed by Bianchi, Lombard, Paffett and Loeb for the big final. 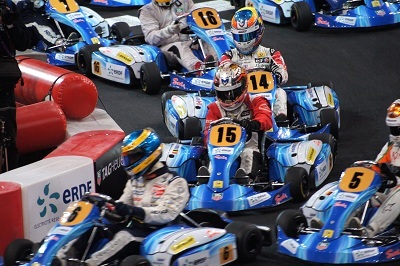 And then were Bourdais, Jérôme D’Ambrosio, Wickens, Jousse and Montagny for the little final. Vergne won it and then there was Sarrazin, Albuquerque, Grosjean and Vautier for the big final. 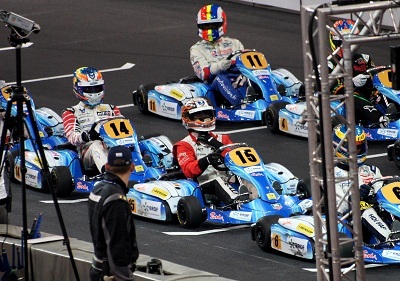 In the little final we had Sutil, Hamilton, Di Resta, Chandhok and Dumas. 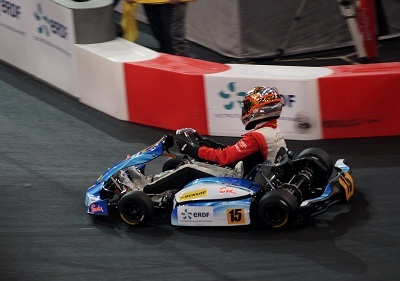 Jérôme was in this race and had to end it at least 3rd to take part to the big final…done!! He was brilliant as always and managed to end this little final 3rd :) Bourdais and Wickens also qualified and Montagny was saved by the public (it had to do noise). Unfortunately this race didn’t go well for Jérôme :( He ended it 11st. Ogier and Montagny had to retire before the end. The final’s winner was Bianchi. The podium was completed by Vergne and Sarrazin. Saturday’s show was fantastic! And of course I’d like to thank Jérôme a lot for his kindness :) He’s always smiling and it’s a real pleasure to talk with him!!! 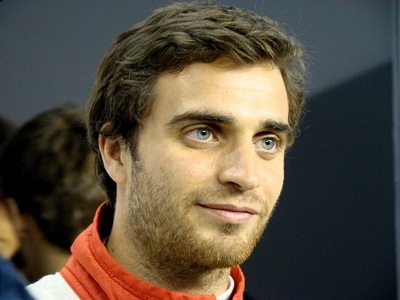 He’s amazing and deserves a seat in F1 for 2012!!!! It was an awesome experience to be there! 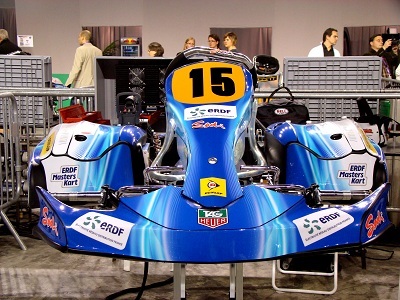 The paddock was not big so that we were able to see all the karts and drivers in the same time. 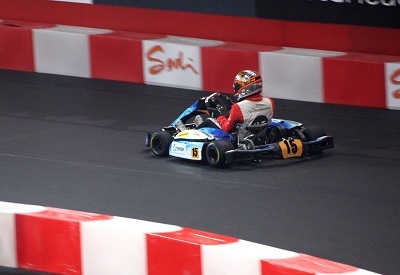 Jérôme was near the entrance, he had a sort of box with his kart and all his stuff. He was really nice with everybody, enjoying the show and also joking with people! This event wouldn’t have been the same without him (ok, especially for me!). And as he’s a competitor, he fought hard to win the race and was a little bit disappointed at the end but didn’t loose his smile. Many drivers were there with their families and friends; it was a cool atmosphere and a very interesting behind the scene! This entry was posted on 2011/12/11 by Julie. It was filed under By Julie V. .
J’adore la dernière photo de vous 2 elle est superbe !